3rd Round: Fantasy Task! | ! *PurpleMoon Creations* ! Third Round at "SL Next Fashion Designer Challenge" organized by Model with Curves Fashion District. "SL ALLOWS US TO BE ANYTHING WE WANT TO BE, LIVE IN ANY FANTASY WE WISH, THIS TASK IS ALL ABOUT FANTASTY, YOUR JOB IS TO CREATE A OUTFIT FOR A FANTASY CHARACTER, I.E FAIRIES, NINJA ASSISIAN, VAMPIRE...GO AS WILD AS YOUR IMAGINATION CAN TAKE YOU." 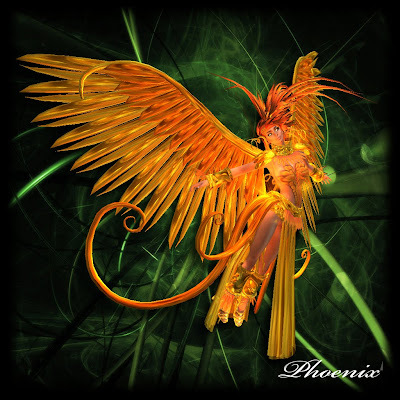 The "Phoenix" is a mythical bird with a colorful plumage of gold and scarlet. It has a 500 to 1,000 year life-cycle, near the end of which it builds itself a nest of myrrh twigs that then ignites; both nest and bird burn fiercely and are reduced to ashes, from which a new, young phoenix, reborn anew to live again. The new phoenix is destined to live as long as its old self. Poulet's vision of this mythical bird is a complete outfit from head to toe. Including the flexi fire hair, sculpted wings and swirls in gold. Also a gleaming collar, bracelets and sculpted shinning prims along with flexi feathers and fire effects to complete this ensemble. Sculpted and glowing fire embraces this outfit on the waist and feet. 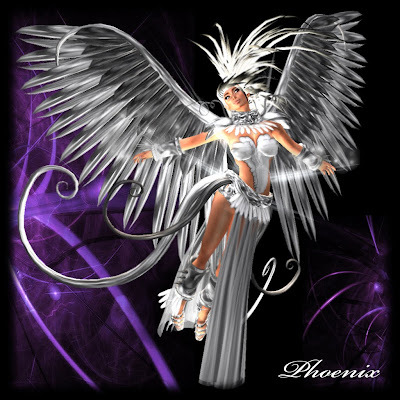 The skirt has the flowing effect as the phoenix's tail. The sculpted sandals and shin guards gives the dramatic energy this mythical bird deserves. The whole outfit for only L$425. I can't wait to see you at the Store! We released two versions, in Gold and Silver. Hope you like them!